China: Muslims forced to drink alcohol and eat pork in “persecusion camps”. Muslims were detained for re-education by China‘s government and made to eat pork and drink alcohol, according to a former internment camp inmate. Asked to comment on the camps by the Associated Press, the ministry said it “had not heard” of the situation. When asked why non-Chinese had been detained, it said the Chinese government protected the rights of foreigners in China and that they should also be law abiding. Chinese officials in Xinjiang did not respond to requests for comment. Chinese are quoted in state media as saying that ideological changes are needed to fight separatism and Islamic extremism. The internment programme aims to rewire the political thinking of detainees, erase their Islamic beliefs and reshape their very identities. The camps have expanded rapidly over the past year, with almost no judicial process or legal paperwork. Detainees who most vigorously criticise the people and things they love are rewarded, and those who refuse to do so are punished with solitary confinement, beatings and food deprivation. The recollections of Mr Bekali, a heavyset and quiet 42-year-old, offer what appears to be the most detailed account yet of life inside so-called re-education camps. Rare interviews with three other former internees and a former instructor in other centres corroborated Mr Bekali’s depiction. Most spoke on condition of anonymity to protect their families in China. Mr Bekali’s case stands out because he was a foreign citizen, of Kazakhstan, who was seized by China’s security agencies and detained for eight months last year without recourse. Although some details are impossible to verify, two Kazakh diplomats confirmed he was held for seven months and then sent to re-education. The detention programme is a hallmark of China’s emboldened state security apparatus under the deeply nationalistic, hard-line rule of President Xi Jinping. It is partly rooted in the ancient Chinese belief in transformation through education – taken once before to terrifying extremes during the mass thought reform campaigns of Mao Zedong, the Chinese leader sometimes channelled by Mr Xi. Rian Thum, a professor at Loyola University in New Orleans, said China’s re-education system echoed some of the worst human rights violations in history. China’s top prosecutor, Zhang Jun, urged Xinjiang’s authorities this month to extensively expand what the government calls the “transformation through education” drive in an “all-out effort” to fight separatism and extremism. In a June 2017 paper published by a state-run journal, a researcher from Xinjiang’s Communist Party School reported that most of 588 surveyed participants did not know what they had done wrong when they were sent to re-education. But by the time they were released, nearly all – 98.8 percent– had learned their mistakes, the paper said. Transformation through education, the researcher concluded, “is a permanent cure”. A Human Rights Watch (HRW) report released earlier this week claimed that Chinese officials were now regularly imposing themselves on families in Xinjiang in “home stays”. During the visits unwilling hosts are allegedly forced to tell authorities about their lives and political views, and are subject to indoctrination. On the chilly morning of 23 March 2017, Mr Bekali drove up to the Chinese border from his home in Almaty, Kazakhstan, got a stamp in his Kazakh passport and crossed over for a work trip, not quite grasping the extraordinary circumstances he was stepping into. Mr Bekali was born in China in 1976 to Kazakh and Uighur parents, moved to Kazakhstan in 2006 and received citizenship three years later. He was out of China in 2016, when authorities sharply escalated a “People’s War on Terror” to root out what the government called religious extremism and separatism in Xinjiang, a large Chinese territory bordering Pakistan and several Central Asian states, including Kazakhstan. The Xinjiang he returned to was unrecognizable. All-encompassing, data-driven surveillance tracked residents in a region with around 12 million Muslims, including ethnic Uighurs and Kazakhs. Viewing a foreign website, taking phone calls from relatives abroad, praying regularly or growing a beard could land a person in a political indoctrination camp, or prison, or both. The US State Department estimated those being held are “at the very least in the tens of thousands”. A Turkey-based TV station run by Xinjiang exiles said almost 900,000 were detained, citing leaked government documents. Adrian Zenz, a researcher at the European School of Culture and Theology, puts the number between several hundreds of thousands and just over 1 million. Government bids and recruitment ads studied by Zenz suggest that the camps have cost more than $100m (£74m) since 2016, and construction is ongoing. Mr Bekali knew none of this when he visited his parents on March 25. He passed police checkpoints and handed over his decade-old Chinese identity card. Mr Bekali was held in a cell, incommunicado, for a week, and then was driven 500 miles to Karamay’s Baijiantan District public security office. There, they strapped him into a “tiger chair”, a device that clamped down his wrists and ankles. They also hung him by his wrists against a barred wall, just high enough so he would feel excruciating pressure in his shoulder unless he stood on the balls of his bare feet, he claimed. They interrogated him about his work with a tourist agency inviting Chinese to apply for Kazakh tourist visas, which they claimed was a way to help Chinese Muslims escape. “I haven’t committed any crimes!” Mr Bekali said he yelled. They asked for days what he knew about two dozen prominent ethnic Uighur activists and businessmen in Kazakhstan. Exhausted and aching, Mr Bekali coughed up what he knew about a few names he recognised. The police then sent Mr Bekali to a 10sqm cell in the prison with 17 others, their feet chained to the posts of two large beds. Some wore dark blue uniforms, while others wore orange for political crimes. Mr Bekali was given orange. In mid-July, three months after his arrest, Mr Bekali received a visit from Kazakh diplomats. 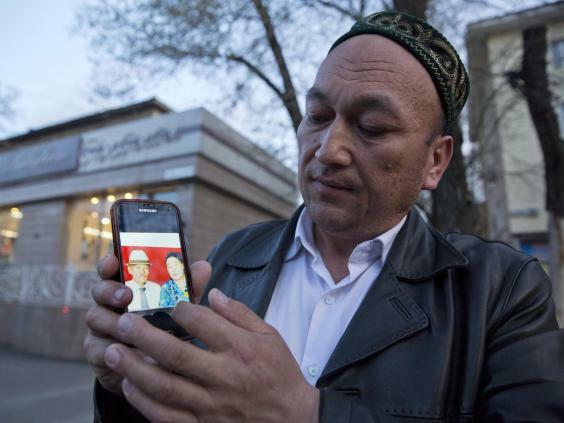 China’s mass detention of ethnic Kazakhs – and even Kazakh citizens – had begun to make waves in the Central Asian country of 18 million. Kazakh officials say China detained 10 Kazakh citizens and hundreds of ethnic Kazakh Chinese in Xinjiang over the past year, though they were released in late April following a visit by a Kazakh deputy foreign minister. Four months after the visit, Mr Bekali was taken out of his cell and handed a release paper. Mr Bekali was driven from jail to a fenced compound in the northern suburbs of Karamay, where three buildings held more than 1,000 internees receiving political indoctrination, he said. Internees would wake up together before dawn, sing the Chinese national anthem, and raise the Chinese flag at 7.30am. They gathered back inside large classrooms to learn “red songs” like “Without the Communist Party, there is no New China”, and study Chinese language and history. They were told that the indigenous sheep-herding Central Asian people of Xinjiang were backward and yoked by slavery before they were “liberated” by the Communist Party in the 1950s. Discipline was strictly enforced and punishment could be harsh. Mr Bekali was kept in a locked room almost around the clock with eight other internees, who shared beds and a wretched toilet. Cameras were installed in toilets and even outhouses. Baths were rare, as was washing of hands and feet, which internees were allegedly told was equated with Islamic ablution. Mr Bekali and other former internees said the worst parts of the indoctrination program were forced repetition and self-criticism. Although students did not understand much of what was taught and the material bordered on the nonsensical to them, they were made to internalise it by repetition in sessions lasting two hours or longer. One by one, internees would stand up before 60 of their classmates to present self-criticisms of their religious history, Mr Bekali said. The detainees would also have to criticise and be criticised by their peers. Those who parroted official lines particularly well or lashed into their fellow internees viciously were awarded points and could be transferred to more comfortable surroundings in other buildings, he said. “I was taught the Holy Quran by my father and I learned it because I didn’t know better,” Mr Bekali heard one say. A Uighur woman told AP she was held in a centre in the city of Hotan in 2016. She said she and fellow prisoners repeatedly were forced to apologise for wearing long clothes in Muslim style, praying, teaching the Quran to their children and asking imams to name their children. Other detainees and a re-education camp instructor told similar stories. In mid-2017, an Uighur former on-air reporter for Xinjiang TV known as Eldost was recruited to teach Chinese history and culture in an indoctrination camp because he spoke excellent Mandarin. He had no choice. The first group typically consisted of illiterate minority farmers who had committed no ostensible crimes other than not speaking Chinese. The second class was made up of people who were caught at home or on their smartphones with religious content or so-called separatist materials, such as lectures by the Uighur intellectual Ilham Tohti. The final group was made up of those who had studied religion abroad and come back, or were seen to be affiliated with foreign elements. In the latter cases, internees were often were sentenced to prison terms of 10 to 15 years, Eldost said. Violence was not regularly dispensed, but every internee interviewed said they had seen at least one incident of rough treatment or beatings. Eldost said he tried in little ways to help his internees. Tasked with teaching the Three Character Classic, a Confucian standard taught widely in elementary schools, he would make up mnemonic devices to help his students – including elderly or illiterate Uighur farmers who barely knew their own language – recite a few lines. He also advised students to stop habitually saying “praise God” in Arabic and Uighur because other instructors punished them for it. Another former detainee, a Uighur from Hotan in southern Xinjiang, said his newly built centre had just 90 people in two classes in 2015. There, a government instructor claimed said that Uighur women historically did not wear underwear, braided their hair to signal their sexual availability, and had dozens of sexual partners. Those who did not obey, were late to class or got into fights were put for 12 hours in a loose body-suit that was made of iron and limited their movement, he said. Those who still disobeyed would be locked in a tiger chair for 24 hours. As one form of punishment, he said, instructors would press an internee’s head in a tub of ice and water. After three months, Samarkan could not take the lessons anymore, so he bashed his head against a wall to try to kill himself. He merely fell unconscious. After 20 days, Mr Bekali also contemplated suicide. Several days later, because of his intransigence and refusal to speak Mandarin, Mr Bekali was no longer permitted to go into the courtyard. Instead, he was sent to a higher level of management, where he spent 24 hours a day in a room with eight others. A week later, he went to his first stint in solitary confinement. He saw a local judicial official walking into the building on an inspection tour and yelled at the top of his lungs. He thought even his former detention centre, with the abuse he suffered, would be better. He was again hauled off to solitary confinement. It lasted 24 hours, ending late afternoon on 24 November. That is when Mr Bekali was released, as suddenly as he was detained eight months earlier. A Baijiantan policemen who had always gone easy on Mr Bekali during interrogation appeared and checked him out of the facility. “You were too headstrong, but what the department did was unjust,” he told Mr Bekali as he drove him to his sister’s home in Karamay. The next morning, a Saturday, the police opened their immigration office for Mr Bekali to pick up a unique, 14-day Chinese visa. His original had long expired. Mr Bekali left China on 4 December. Seeking compensation from the Chinese government is out of the question. But Mr Bekali keeps a plastic folder at home of evidence that might prove useful one day: his passport with stamps and visas, travel records and a handwritten Chinese police document dated and imprinted with red-ink seals. At first, Mr Bekali did not want his account published for fear that his sister and mother in China would be detained and sent to re-education. But on March 10, back in China, the police took his sister, Adila Mr Bekali. A week later, on March 19, they took his mother, Amina Sadik. And on April 24, his father, Ebrayem. Mr Bekali changed his mind and said he wanted to tell his story, no matter the consequences.